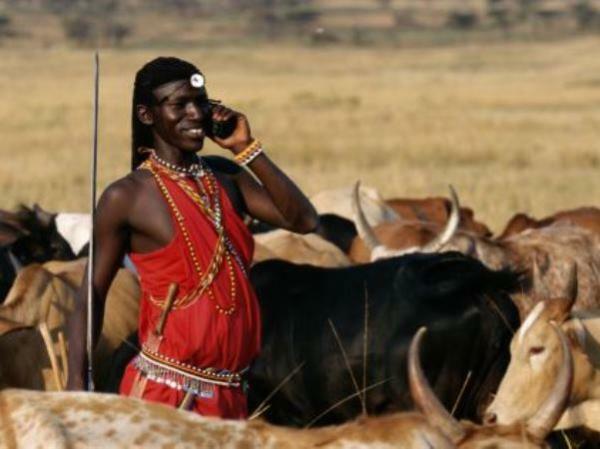 More people across Africa have access to a cellphone network than they do to electricity, piped water, or a health clinic, according to the latest Afrobarometer released on Wednesday. The survey, titled "Developing Africa's Infrastructure: the Rough Road to Better Services", also highlights enormous differences between some of the 34 countries sampled. "Africans face highly variable access to basic services in their communities. Cellphone coverage is nearly universal (93 percent), and most communities have access to a school (88 percent). "In contrast, only about a quarter (27 percent) have access to a post office... and sewerage systems are equally rare (28 percent)." With the exception of Algeria, Egypt, Morocco, Tunisia, and the island states of Cape Verde, Madagascar, and Mauritius, all the countries surveyed, including South Africa, are located in the sub-Saharan region. The Afrobarometer survey, produced by social scientists from more than 30 African countries, is co-ordinated by the Institute for Justice and Reconciliation in South Africa, the Centre for Democratic Development in Ghana, and the Institute for Development Studies in Kenya. Among its other key findings is that less than two-thirds of surveyed areas have access to an electricity grid (64 percent), a health clinic (62 percent), and piped water (59 percent). "Country-level differences in access to service infrastructure are enormous -- 89 percent lack access to piped water in Liberia, while teams report 100 percent access in Mauritius. "Rural-urban differences are also large, especially with respect to electricity (a 48 percentage point gap in favour of urban areas), piped water (45 point gap), paved roads (44 point gap), and police stations (38 point gap)." A further key finding was that poverty levels tended to be significantly higher in areas without access to these services compared to areas that had access. On access to electricity, South Africa ranks eighth in the survey, behind Swaziland, Morocco, Algeria, Cape Verde, Egypt, Mauritius, and Tunisia. On water services, it is in 10th place, with 21 percent of the areas within the country that were sampled having no piped supply. This is well behind its northern neighbour, Botswana, which recorded a low seven percent. The continental average is 41 percent. Of the 34 countries surveyed, Namibia scored lowest on average access to police, health, and market facilities, with no-access figures of about 90 percent, 85 percent and 70 percent respectively. The survey notes that while the latest results highlight the enormous problems facing much of the continent, important progress has been made in some areas. "Across 15 countries tracked since 2002/03... there has been a 15 percentage point gain in reported levels of access to an electricity grid." Almost all countries had gained ground in this regard, and some, in West Africa, quite substantially. "In West Africa, Cape Verde (25 points), Nigeria (23 points), Ghana (22 points) and Benin (21 points) all gained significantly. "The gains in southern Africa are more mixed. Mozambique has enjoyed an impressive 30 point gain, and Lesotho has achieved 23 points, but others progressed more slowly, and Madagascar has apparently seen a reported 11 point loss of access." A graph included in the report also shows access to electricity in Zimbabwe plummeted to below 60 percent between 2008 and 2012. -- Post office: 27 percent.